A powerful and adaptive Workflow Software is difficult to come by. There are many on the market, but few Business Process Management Software systems offer the ease of use, flexibility, and power of Comindware‘s Business Process Management Software. Business Process engineering is a much sought after discipline in many organizations. And if you are among the few organizations remaining without a focus on continuous improvement, then you will slowly fall by the wayside as your competitors overtake your market share. The reality is businesses are focusing on continuous improvement disciplines like never before. With ITIL v3, Continuous Service Improvement best practices, coupled with modern Maturity Model scales, businesses are becoming more and more aware of process re-engineering. 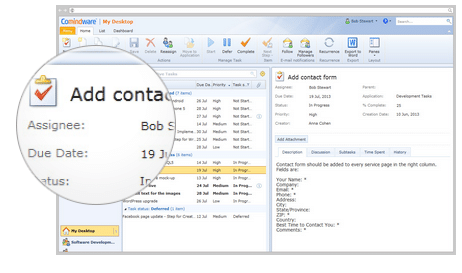 Until now, there really hasn’t been an adaptive and flexible drag-and-drop solution like Comindware, with no coding required. Processes can be easily shared and rolled out amongst teams, in real time. Giving businesses the ability to change operational procedures on the fly, and schedule workflows. Revolutionizing flexibility in adapting to unprecedented situations. 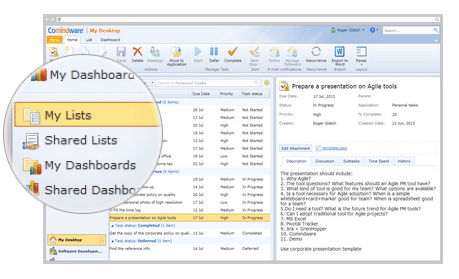 Comindware instantly creates ad-hoc tasks for workflow steps whenever a new event doesn’t fit into existing processes. But much of the magic lies in the reporting. 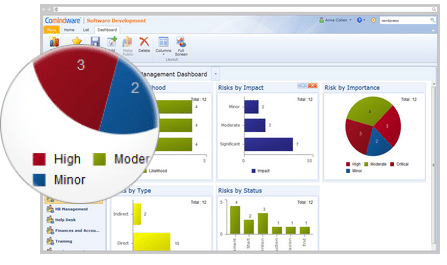 Often in process work it’s difficult to establish reporting and setup metrics and measures, but Comindware’s reporting brings a lot to the table. We’re talking about real-time measures and tracking, allowing for direct and immediate decision making and “steering of the ship.” Their Visual Dashboard and Report builder enable quick delivery of valuable information in seconds using crystal clear and stunning visuals. Likewise, Comindware integrated the ability to automate report creation and delivery to predetermined recipients and pre-scheduled times. Discussions and scattered files are a thing of the past using Comindware, as everyone can stay up to date with real-time tasks. Threads can be captured for future reference, along with relevant files, and other artifacts which can be easily shared to team members. Unlike other task management tools, you can create an unlimited hierarchy of sub-tasks. This way, everyone knows what to do or easily reassign tasks when required. It’s rare that a tool comes along and levels a playing field. In business process modelling, there are several tools available, but many focus only on process mapping, missing the opportunity. With Comindware’s end-to-end process governance, reporting, and management solution, a wise implementation could yield a powerful method to control every aspect of your entire business… from A to Z. That’s huge. Consulting firms take notice, the Swiss Army Knife of Business Process Management & Workflow Software has arrived. What is Business Process Modeling (BPM)? Business Process complexity metric, what for? Are Your Business Processes Too Complex?